152 mm/45 PXIII*5 х 1 pcs. 533 mm DR Mk II4 х 2 pcs. 76.2 mm/45 HA Mk IV2 х 1 pcs. 40 mm Vickers 2-pdr. QF Mk II2 х 1 pcs. 7.7 mm Maxim machine gun Mk I2 х 1 pcs. 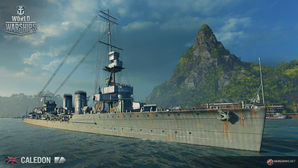 Caledon — British Tier III cruiser. Tier III's Caledon introduces British cruiser captains to something that the cruisers of most other nations don't see until Tier V or VI: multiple centerline mounted turrets. It gives her a lot of flexibility in her firing arcs; flexibility that she will need, since she only mounts five 152mm rifles (compared to St. Louis’ fourteen or Bogatyr’s sixteen). Caledon is badly under-gunned against most of the opponents she will face off against. As is typical of vessels of the era, her anti-aircraft suite is pathetic, and she won't be shooting down many planes (if any) from enemy carriers. As compensation for woeful AA and a sub-par main battery, she has solid top speed and good handling characteristics: her quick rudder shift and good turning radius can go a long way towards avoiding incoming fire. She also sports two twin-tube torpedo launchers on each side, with generous firing arcs and quick reload times that give her a potent punch should she find herself at close range of enemy vessels. Finding — or making — opportunities to use her torpedoes is key for players looking for high damage games out of Caledon. She also gains access to something very unique for a low tier cruiser: the Repair Party consumable. Cruisers of other nations have to wait until Tier VIII or IX to be able to repair damage already taken in a match, but the British start the trend here at Tier III and carry it all the way up the line. Main battery guns traverse quickly enough to keep up with radical maneuvering, even without Expert Marksman. Double twin-tube torpedo launchers on each side. Longest firing range of non-all Tier III cruisers. Has access to the Repair Party consumable, long before the cruisers of other nations do. Torpedo range is only 6.0 km. Only five barrels with a mediocre rate of fire leaves Caledon badly under-gunned against opponents such as Bogatyr and St. Louis. Low health and armor combine to make Caledon very fragile under concentrated fire. Like Weymouth, the Fire Control System upgrade is less expensive than Hull (B) and is a significant boost to Caledon’s range. Invest experience there first, then pick up the second hull. Though Caledon may encounter enemy aircraft carriers, her AA is not worth sinking commander skill points into. Focus on survivability skills; Survivability Expert at Level 3 buffs not only her overall health pool, but makes her Repair Party heal more potent. Being the second-to-least armored cruiser at Tier III, captains will find it useful to equip premium Repair Party II as it will greatly increase Caledon’s survivability. Damage Control Party II is also recommended for captains willing to shell out the credits (or doubloons). Captains who are in a hurry to grind past Caledon should equip an Equal Speed Charlie London signal for faster experience gains. Additionally, Caledon’s has access to the Repair Party consumable makes it viable to mount India Delta for extra health recovery. Caledon fires a broadside of armor piercing shells. Caledon borrows smoke and fires at an enemy St. Louis class cruiser. Armor piercing shells from the Caledon break apart upon contact with Arkansas Beta armor. Armor piercing shells do manage to penetrate the superstructure of the Arkansas Beta. HMS Caledon in harbour during WW1, approximately 1917. HMS Caledon and her sister ships were ordered in 1915 as slight modifications of the preceding Centaur class cruisers. These ships were very rugged and capable ships, built to serve in North Sea and Atlantic. Although usually they had good sea-going qualities, the ships did prove to be rather wet forward at times. The main difference over the previous Centaurs was the new geared turbine machinery used, providing a slightly higher top speed. Other changes included increased size and altered hull form for better sea-keeping, alongside a raked bow. The cruisers carried five BL Mk.XII 152mm (6-inch) guns, in 'A', 'P', 'Q', 'X' and 'Y' positions, the same as the previous Centaur class. Although this was a lighter armament than contemporary German light cruisers, the arrangement of all the guns on the centerline allowed for similar firepower to a broadside. Another change from previous classes was the inclusion of above water torpedo tubes, in two sets of twin tubes per side, rather than the submerged tubes of previous classes. The armor of the C class cruisers was centered mostly around the main belt with a 51mm belt mounted on 25mm backing plate protecting the machinery. The armor thinned towards the extremities to 25mm, and the deck was also 25mm. Anti-aircraft armament began with 2 76mm (3-inch) guns fitted to the cruisers on completion, although these guns could potentially be used against submarines too. Caledon herself had a flying off platform fitted for anti-zeppelin purposes, though this was subsequently removed, and during the inter-war period, the AA armament was reinforced a pair of single 40mm 'pompoms' By the beginning of World War II, Caledon was considered old and outdated. Like other members of the C-class, she was converted into an anti-aircraft cruiser, the last C-class to do so. Caledon’s original main battery and torpedo tubes were removed and her superstructure was altered to accommodate the new armament. The new armament consisted of 6 dual purpose 102mm (4-inch) guns in three twin mounts. Numerous Bofors guns and other 20mm guns were mounted during her first and second refits with more added as the war continued. Caledon’s sister ships Calypso and Caradoc did not receive extensive modifications and at most received only five 20mm 'Oerlikon' AA guns. The four cruisers of the class were ordered in December 1915, with a further five ships being added in 1916, however the last five were modified to become the Ceres class. Sometimes the class is called the Calypsoclass as Calypso was the first ship laid down, although Caledon was the first to be completed and commissioned. HMS Caledon joined the Grand Fleet in March 1917 and was assigned to the 6th Light Cruiser Squadron. She participated in the Second Battle of Heligoland Bight as the leader of the 1st Light Cruiser Squadron in November 1917, where she was damaged by a 12-inch shell from a Kaiser class battleship but survived. In 1919, operated against Soviet forces in Latvia and the Baltic. Remaining in commission, she served in the Atlantic and Mediterranean during the interwar period until she was placed in the Naval Reserve in 1931. Recommissioned in 1939, Caledon was posted to the North Atlantic until mid-1940 when she was transferred to the Mediterranean for convoy duty and as support for British operations in Somaliland. In 1941, Caledon was transferred to the Eastern Fleet and operated in the Indian Ocean until 1942, when she returned to the UK for conversion into an anti-aircraft cruiser. Following conversion, in 1943, Caledon was again sent to the Mediterranean for convoy duty, and participated in Operation Dragoon in 1944. She survived the war, earning three battle honors, and was eventually paid off for scrapping in 1948. HMS Calypso joined the Grand Fleet with Caledon and also participated in the Second Battle of Heligoland Bight. She was also damaged, a shell destroying her bridge and killing all present, including her commander. After the war, Calypso was assigned to patrol duties and anti-Bolshevik operations in the Baltic, capturing two destroyers, Izyaslav-class Avtroil and Spartak, in December 1918. In 1924, Calypso evacuated members of the Greek royal family after a coup, before she was placed in reserve in 1932. Recommissioned in 1939, Calypso was also assigned to the Northern Patrol along with Caledon. From September to November 1939, Calypso captured three German merchants and participated in the hunt for Scharnhorst and Gneisenau, alongside her sister. In 1940, she was also sent to the Mediterranean, where she was hit by a single torpedo from the Italian submarine Alpino Attilio Bagnolini in the early morning of 12 June 1940, two days after Italy declared war on Great Britain. Calypso was lost with thirty-nine men south of Crete. HMS Caradoc, while also assigned with her sisters to the Grand Fleet, escaped damage in the Second Battle of Heligoland Bight, and World War I as a whole. She was present and participated in the capture of Avtroil and Spartak with Calypso in December 1918, serving her interwar years in the Mediterranean, China, and the Americas until she was transferred to the reserve in 1930. Caradoc was reactivated along with her remaining three sisters in 1939. Her first mission of note was the transport of gold to Halifax as payment for war materials. Transferred to the Caribbean until 1942, Caradoc captured two German merchants before sailing to New York for refit in late 1941. Having finished her refit in February 1942, Caradoc sailed to the Indian Ocean to join the Eastern Fleet. There she served in various administrative capacities like a training ship until the end of the war in 1945. Caradoc earned one battle honor and was paid off and sold for scrapping in 1946. The fourth ship of the Caradoc sub-class, HMS Cassandra, also served with the Grand Fleet in World War I. Operating against Bolshevik forces on Baltic patrol duties after the end of hostilities against Germany in 1918, Cassandra struck an uncharted German mine off the coast of Estonia and sank quickly, though fortunately only eleven men died. Hull (A) is accurate for Caledon during the interwar period, however hull (B) adds two Maxim 7.7mm machine guns that Caledon most likely never received, although it is possible that Calypso received these in different locations. The placement of the 40mm AA guns is questionable, as they are usually shown to be placed amidships, not aft of 'X' gun. The gun shields had armour 25.4mm thick, not 76.2mm. The 25mm deck armour of Caledon is not present. Although Caledon uses the same 152mm Mk.XXII guns as Danae and Emerald, Caledon — like other regular Royal Navy light cruisers in-game — only gets access to AP shells. Historically, ships using the Mk.XXII gun were outfitted with both AP/CPBC (Common Pointed Ballistic Cap) as well as HE shells. HMS Caledon in 1944 after refit. Caledon-class light cruiser HMS Cassandra underway at sea. Caledon-class light cruiser HMS Caradoc in May 1942 after her U.S. refit. HMS Caradoc in the Baltic Sea near Liepāja, Latvia, December 1918. HMS Caledon's crew scraping ice off, December 1918. HMS Caledon after a collision with the Italian vessel SS Antares. Caledon-class light cruiser HMS Calypso laying down a smoke screen. HMS Caradoc bombarding Bolshevik positions in Estonia in December 1918. This page was last modified on 1 May 2018, at 22:17.